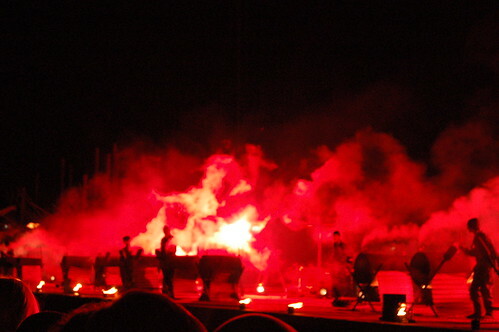 A steampunk symphony, a cacophony of hot noise, fireworks, flames and the first film ever exhibited in public. Blast, one of the opening events of this year’s ArtsFest, is quite possibly the largest, most boiling and definitely the most whistley performance you’ll see ever (and it’s on tomorrow as well) see. A blast on a horn, a blast of air, blast as a manifesto Vorticist in sound and steam, it was history, an alternate one where steam was harnessed as mammoth-scale entertainment rather than to drive industry. One of the first working steam trains was made in Brum, the station was a wonderful canvas, pyrophones are the chainsaw massacre of defined sound. Can you play the heavy industry? They did. If I wrote for the music press I’d call it Mad Max meets The Clangers, on acid probably. I’d also make a crack about Richard Wilson (The Turner prize nominee involved) and end on… I don’t believe it, or something. But I don’t anymore, so I’ll say it was bloody great, say that if there’s nothing else good at ArtsFest this year it was still worthwhile, and point you to my Flickr pics. And to CiB’s preview for something more coherent.